ABC offers full-time tracks in Old-Time Banjo, Bluegrass Banjo, Fiddle, Guitar, and Mandolin. ABC also offers classes in other instruments (e.g. bass) and in jamming. While an old-time banjo student will be faced with a choice among multiple simultaneous old-time banjo classes in every period, even a student playing an instrument with just one or two classes will find other interesting classes (jamming, singing, etc.) and hosted jams (and time for practicing) to fill the time and make the weekend seem much too short! Bluegrass Banjo Old-Time Banjo Fiddle, Guitar, Mandolin, Bass, . . .
Janet Beazley plays banjo and sings with the California bluegrass band Chris Stuart & Backcountry and in the duo Chris Stuart & Janet Beazley. She has toured extensively with CS&B throughout the United States, Canada, the United Kingdom, Europe, and the Middle East. Janet has taught bluegrass banjo, harmony singing, music theory and song writing at the British Columbia Bluegrass Workshop, California Bluegrass Association Music Camps, Midwest Banjo Camp, American Banjo Camp, Augusta Heritage Center Bluegrass Week, Banjo Camp North, Munich Banjo Camp, and Sore Fingers Week in the UK. She produced and engineered all three of the CS&B albums as well as solo projects by Chris Stuart and flatpicking guitar virtuoso Eric Uglum. Janet Beazley’s solo CD, 5 South, spent eight months on the Bluegrass Unlimited National Survey Chart, and she was featured as the cover story in Banjo Newsletter for the December 2011 issue. She is also a specialist in early music, teaching and performing on Renaissance and Baroque instruments. Wes Corbett A banjo player of uncommon grace and facility, Wesley Corbett has spent the last 17 years studying, touring and teaching his instrument. He has recorded and performed with numerous musicians, including Joy Kills Sorrow, The Bee Eaters, The Biscuit Burners, the David Grisman Quintet, Molly Tuttle, Sierra Hull, Sarah Jarosz, Yonder Mountain Stringband, Chris Eldridge, Mike Marshall, Darol Anger, Robert Earl Keen, Crooked Still, Bruce Molsky, Tony Trischka, Alan Munde, and many others. Wes served as the professor and grant manager of the banjo program at Berklee College of Music between 2011-2015. He toured internationally with the critically acclaimed acoustic string band Joy Kills Sorrow until 2014 which was featured on NPR's A Prairie Home Companion and Mountain Stage. He currently tours with The Molly Tuttle Band, and in the acclaimed duo Simon Chrisman & Wes Corbett. He now makes his home in Nashville Tennessee. Alan Munde needs no introduction to long-time Bluegrass fans. From his early creative work with Sam Bush in Poor Richard's Almanac to his traditional bluegrass apprenticeship with Jimmy Martin and the Sunny Mountain Boys to his 21-year stint anchoring the landmark Country Gazette, Alan has blazed a trail as one of the most innovative and influential banjo players of all time. Along the way, Alan also recorded and contributed to numerous instrumental recordings, including the 2001 IBMA Instrumental Album of the Year -- "Knee Deep in Bluegrass." Alan has supplemented his recorded work with several instructional publications for the banjo; from 1986-2006 he taught Bluegrass and Country Music at South Plains College in Levelland, Texas. Mike Munford has been touring with rising bluegrass star Frank Solivan and his band Dirty Kitchen since 2008. An extremely eclectic player, he is equally at home with Scruggs- and melodic-styles, all delivered at break-neck speed in a seemingly effortless improvisational flow. He is much in demand as a sideman, and among the artists Mike has worked with in that capacity are Tony Rice, Tony Trischka Lynn Morris, Larry Rice, Peter Rowan, Valerie Smith and Frank Wakefield. From 1976-2000, Mike served as vice president and general manager at a music store called Baltimore Bluegrass. During his years there he not only got to know several generations of amateur and professional pickers, but he learned so much about working with instruments that he is considered a set-up guru. He now makes his home in Shrewsbury, Pennsylvania and – when not occupied with Dirty Kitchen – he tours extensively with various artists and bands in the mid-Atlantic region. Mike Stahlman is a Portland, Ore. banjo player whose playing style was heavily influenced by Earl Scruggs and Alan Munde. Mike has taught bluegrass banjo at Portland Community College in Portland since 1997, and currently plays banjo and tours with the Oregon-based Lee Highway. He also plays with The Loafers. Mike has recorded two banjo instrumental CD's -- "Bluebonnet," and "First Dance." Paul Brown is a respected traditionalist and innovator in old-time music. He started playing banjo at age ten. He spent years learning directly from some of the last southern mountain fiddle, banjo, and guitar players to emerge before the age of radio and recordings. His mentors include banjoist and fiddler Tommy Jarrell, banjoist Gilmer Woodruff, guitarists and singers Paul Sutphin and Fields Ward, fiddlers Robert Sykes and Luther Davis, banjoist Matokie Slaughter and mandolinist Verlen Clifton. He played for three decades with fiddler Benton Flippen, and has been a member of bands including The Smokey Valley Boys, Robert Sykes & the Surry County Boys, The Toast String Stretchers, and The Mostly Mountain Boys. Paul maintains a love of the old ways of playing, but also heeds his mentors’ shared belief in creating one’s own signature sound. He explores tunings, techniques and repertoire constantly on banjo and fiddle. 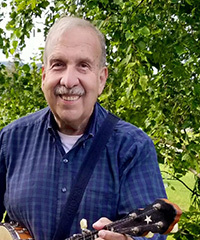 A multiple-time first place winner at the Appalachian String Band Music Festival and other events, he has been teaching at music camps and festivals across the U.S. and abroad since the early 1970s. His latest fiddle album is Red Dog (2018), and he’s the banjoist on a new album featuring Tennessee fiddler Mike Bryant. www.paulbrown.us.com. Cathy Fink is a multi-GRAMMY® Award winning artist continuing a 45 year love affair with the banjo. Her banjo music includes original compositions played on everything from fretless minstrel-style banjos to modern replicas of instruments from the 1920’s. Cathy’s first solo banjo recording, “Banjo Haiku” has become an underground bible of the old-time clawhammer style. “Banjo Talkin’”, the 2007 release with special guest, Marcy Marxer, won a GRAMMY® nomination in the “Best Traditional Folk Album” category. Nat Hentoff of The Progressive and Village voice stated, " Her sound, phrasing, and resilient time combine with a compelling presence." Cathy teaches banjo online at www.truefire.com, www.homespuntapes.com. Joe Newberry is a Missouri native and North Carolina transplant who has played music most of his life. Known far and wide for his powerful banjo playing, he is also a prize-winning guitarist, fiddler, and singer. Joe was a frequent guest on Garrison Keillor’s A Prairie Home Companion, and was recently featured on the Transatlantic Sessions tour in the United Kingdom with fiddler Aly Bain and Dobro master Jerry Douglas. In addition to performing solo, Joe plays in a duo with mandolin icon Mike Compton, sits in the banjo chair with old-time music legends Mike Craver, Bill Hicks, and Jim Watson, and also performs with the dynamic fiddler and step-dancer April Verch. The recipient of the songwriting prize for Gospel Recorded Performance at the 2012 IBMA Awards for his song "Singing As We Rise," and co-writer of the 2013 IBMA Song of the Year for "They Called It Music," Joe writes songs that consistently show up on the Bluegrass charts, does solo and studio work, and teaches and performs at festivals at home and abroad. Perhaps the best-known exponent of the "melodic" clawhammer style, Ken Perlman is known wherever banjos are played as a master of clawhammer technique and an expert teacher of clawhammer mechanics. He has been a Banjo Newsletter columnist for 20 years; he has written several books on clawhammer instruction including the well known works Melodic Clawhammer Banjo and Clawhammer Style Banjo, he has recorded several series of audio and video banjo instruction, and he has taught at well over a dozen music camps including the Festival of American Fiddle Tunes, the Puget Sound Guitar Workshop, Rocky Mountain Fiddle Camp, Common Ground on the Hill, and the Tennessee Banjo Institute. Laura Smith was born and raised in Hawai'i, surrounded by the music of the islands, her Dad's piano and tenor banjo music, and the rich harmonies of the church choir. She started playing old time banjo in 1973 when she attended the Sweet's Mill Music Camp in California and has been playing and singing ever since. She sang with Larry Hanks for years and more recently has been in a duo with Steve Palazzo. She taught in the public schools for 23 years and has taught at the Puget Sound Guitar Workshop, the American Banjo Camp, the Georgia Strait Workshop, and the California Coast Music Camp. She lives in Bellingham, Washington. Greg Canote and Jere Canote, the Canote Brothers from Seattle, WA, are as renowned for their affable attitudes and humor as they are for their music. Greg on fiddle, and Jere on guitar, and both on banjo ukes, perform zany concerts, play for dances, lead songs, and promote a good time! The twin brothers started singing soon after they were born and haven't closed their mouths since. They spent their early years in California's Sacramento Valley, inventing songs with their father at the piano and tagging along with their parents' folk and square dance group. They honed their skills performing in many bands and discovered old-time music in the mid 1970s. In 1978 they attended the Festival of American Fiddle Tunes in Port Townsend, WA, and eventually became frequent teachers there. After touring the country with dance caller and singer Sandy Bradley for four years, they returned to the Northwest for a thirteen year stint on Seattle's National Public Radio show, "Sandy Bradley's Potluck," as Sandy's affable side-kicks. The rigors of finding new material for a weekly radio show kept the twins on their toes, mining and performing gems of American music of the past as well as writing new songs in those styles. Peter Langston will play anything with strings on it (even the banjo!). He has played in bands on both the East Coast (Metropolitan Opry, Wretched Refuse) and the West Coast (Puddle City, Entropy Service, Portland Zoo), and has performed with such notables as Doc Watson, Reverend Gary Davis, Tony Trischka, Peter Rowan, Chill Wills, Alison Brown, Johnny Gimble, and Mike Seeger. He appears regularly with bluegrass/Americana band 3 Play Ricochet. Chris Luquette switches seamlessly from bluegrass to jazz, and from International music to rock; he has also studied Brazilian jazz with Brazil music legend, Jovino Santos Neto. Although he his best known for his acoustic guitar playing, he is also adept at electric guitar, mandolin, banjo, bouzouki, bass, and drums! A Seattle native, Chris was a founding member of the local band Northern Departure, and he has performed on stage with such notables as Jerry Douglas, Emmylou Harris, the Steep Canyon Rangers, Kenny and Amanda Smith, and the Boxcars. For the last few years, he has been the regular guitar player for the well-known touring bluegrass band Dirty Kitchen, which also features fellow instructors Mike Munford and Frank Solivan. Mick Nicholson started out as a tuba player, and was a member of the Bremerton Symphony for 6 years. While a Navy musician in the 1970s, he led several jazz and rock bands as an electric bassist touring thoughout the Pacific. In order to concentrate on the upright bass, Mick joined the Washington, DC Navy Band in 1984, culminating with a four year stint in the navy's premier Country/Bluegrass group, "Country Current." Mick moved back home to the Northwest in 1995 and quickly became an active player in the local acoustic music scene. Comfortable with a wide variety of styles, he has gigged with artists ranging from Vince Gill to Dizzy Gillespie. Presently, he is a member of "Me and the Boys" (bluegrass), "The Don Alverson Quintet" (jazz and dixieland), and "The Less Paulish Trio" (Django on steroids). In addition, Mick freelances as an electric and acoustic bassist and teaches at various band camps and workshops. He also plays a mean tuba, though he does not endorse or receive any remuneration from the Mean Tuba Company. Frank Solivan is a nationally known band leader and acclaimed mandolinist. After six years as a member of the United States Navy’s elite bluegrass ensemble Country Current, he organized Dirty Kitchen - a tight-knit band featuring some of the best players on the scene today (including fellow 2019 ABC instructors Mike Munford on banjo and Chris Luquette on guitar!). Frank's original music and original take on covers has taken Dirty Kitchen to the tops of radio charts; the group has also been featured at major music festivals, high end venues, and music camps throughout North America and abroad.